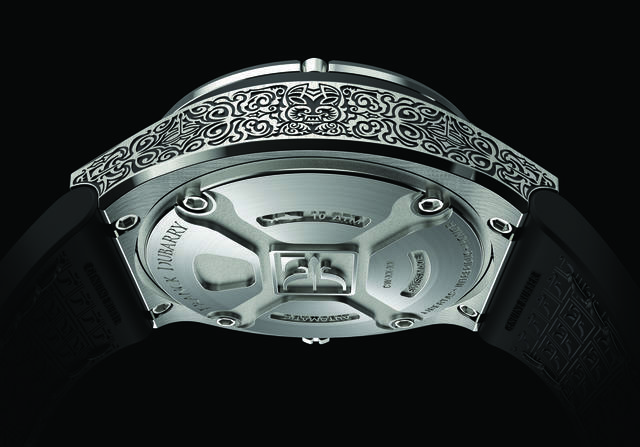 In the nine years TechnoMarine flourished, it sold more than 2.5 million diamond-set steel, gel and rubber watches. Founder Franck Dubarry’s idea to combine precious gems with non-precious materials to make distinctive fashion watches was well ahead of its time, and his design cues have seeped deeply into the makeup of today’s fashion timepieces at both ends of the price spectrum. After selling the brand in 2007, Dubarry several years ago reactivated his sense of fashion lifestyle with a new eponymous watch brand. Franck Dubarry, the brand, now creates colorful, highly patterned Swiss made watches verging on the avant-garde in a wide range of prices. 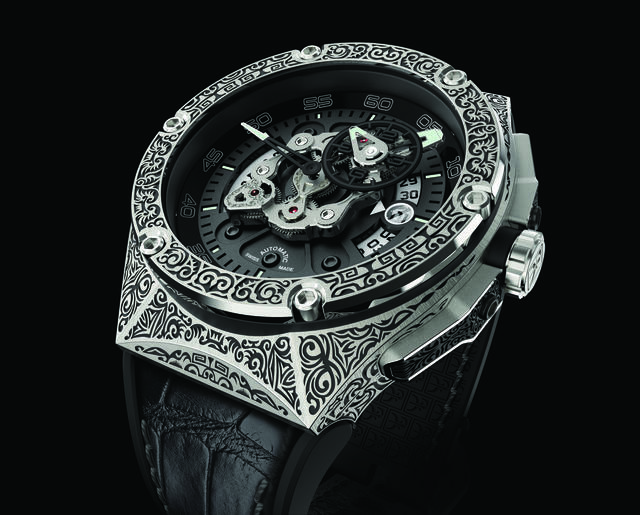 Collections with names like Crazy Balls, Intrepidus, Crazy Colors and Fileteado are filled with French-influenced themes, etched cases and multi-hued dials. Gemstones continue to play a role in a few of the new collections, but the emphasis at Franck Dubarry is on a rainbow of colors, mixed materials and a freedom of expression. The latest Dubarry collection, called Crazy Wheel, is more technical than those earlier debuts. 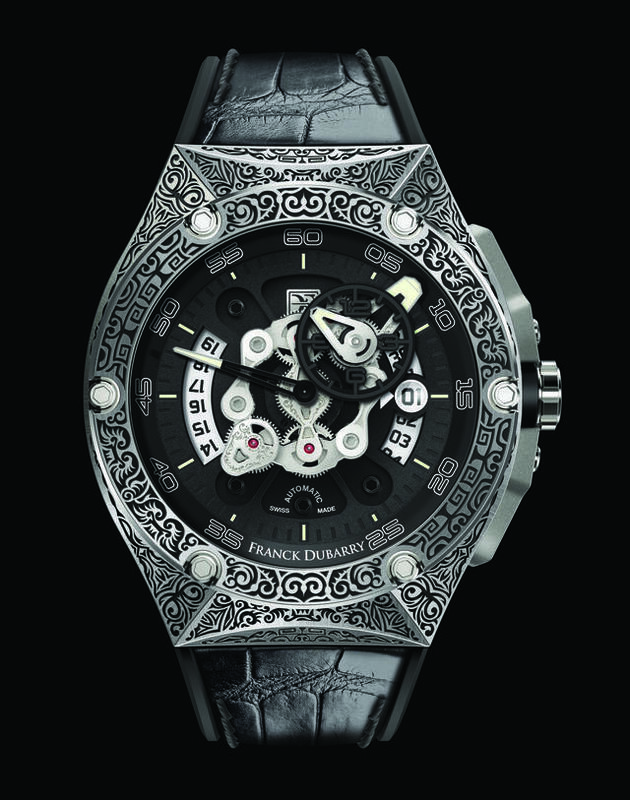 It features watches with a fascinating display of open architecture that stars a multi-level automatic movement made to expose all its Soprod-based going-train gearing, all surrounded by an etched 43mm x 50mm case. 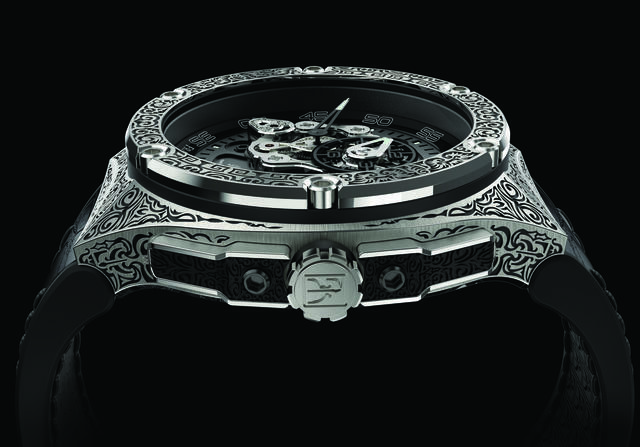 Those who recall TechnoMarine’s Maori collection will recognize a similar pattern on the Crazy Wheel case. Crazy Wheel prices will start at just under $13,000. He notes that he prefers to uphold the notion of innovative design. He considers himself an “iconoclast creator” whose has an uncanny ability to identify and insert current codes of fashion lifestyles into his work. “I make watches because I think that you buy a brand for the same reason that you buy a car,” he adds. “You want to put out your own judgment and create a valuation method for the things you buy in front the of the crowd that you care for. People buy Ferraris or Bentleys or Volvos for different reasons. They do the same with the watches.